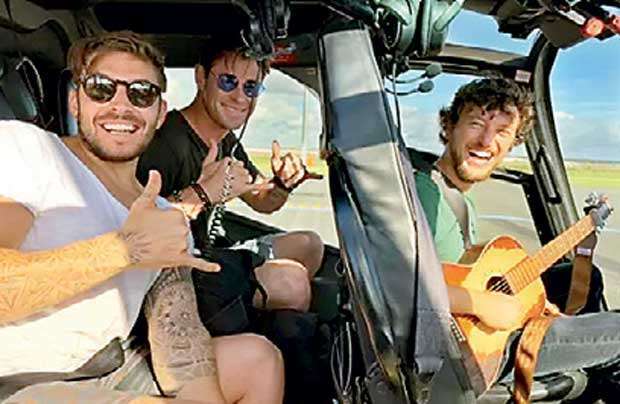 American hitchhiker and musician Scott Hildebrand landed at Brisbane Airport last week got lucky when he was picked up on the side of the road by a couple of Aussie guys who advised they would take him to Byron Bay. Little did he know he was talking to famous local resident, Chris Hemsworth who plays Thor in the Marvel franchise and his friend, personal trainer Luke Zocchi. Zocchi captured the whole event on his phone and posted it to Hemswoth’s Instagram page, which has had over 2 million views so far. The biggest surprise for “Scotty” was yet to come – they weren’t driving all the way to Byron, they were actually taking a helicopter there with Hemsworth joking “Scotty’s got to chip in for the gas, which I reckon is about $4000!” Upon arrival into beachside Byron, the mighty Thor said goodbye to his new friend “Alright Scotty, back to the hitchhiking!”.